I was at a grade-school sleepover when a friend’s older sister entered the rec-room basement with a tube of chocolate-chip cookie dough and a spoon, steadily chomping her way through the whole thing. I was enraptured, as I had already realized that snatching the dough when my mom wasn’t looking was my favorite part of cookie-making. You could just… do that? Take a tube of dough and go to town? I mean, you shouldn’t do that. Of course not. It says so right there on the package. “Maybe it bakes into a better cookie?” one taster diplomatically added, but we’ll never know. We are here to eat raw cookies and that is it. And so, onward to the classic of the genre. Pretty sure Toll House is what my friend’s sister was eating all those years ago, and it remains the high bar of the genre. It basically tastes like what your dough would taste like if you made it from scratch, with a slight, delicate, addictive saltiness. Also, the texture was perfect: “nice and squishy,” one taster enthused. Ironically, the Mrs. Fields dough boasted that it had no preservatives; Nestlé made no such claims, but tasted much more homemade. But ours is not to reason why; ours is to ingest all the cookie dough. Our group devoured it like manna in the desert, wiping away the tears that accompanied the childhood memories this dough conjured up (okay, maybe that was just me). 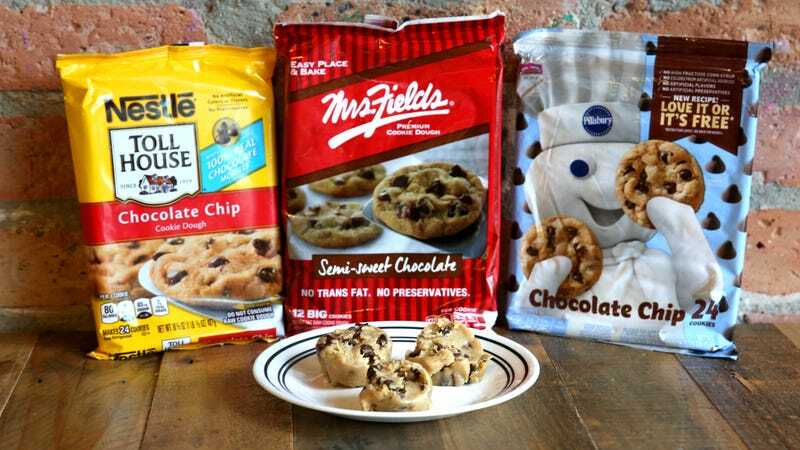 Pillsbury is hyped for its dough game with a new recipe that offers you a money-back guarantee right there on the package: “Love it or it’s free!” Sorry Doughboy, but no dice. This dough was a little lighter in color than the previous cookies, but without a noticeable dose of salt. So Pillsbury just tasted like a sugar cookie with some chocolate chips in it. “All I taste is sugar, not cookie,” one person described. One of our tasters liked it because it reminded her of the cookie dough they used to sell at her school on Market Days; this doesn’t seem like a ringing endorsement.